“The timescale won’t be very long,” says Dr Gordon Fletcher, co-director of Salford Business School's Centre for Digital Business, who believes that in three years brainwear will be a perfectly normal part of everyday life. “In the short term there are already products which take the Jedi mind training angle.” These allow you to move physical objects with your brain. “Nice touch. Nice bit of salesmanship. Nice bit of marketing. But that is also a really soft short-term approach to what the potential it,” he explains. The thing that always “fascinated” Fletcher was in early iterations of products they “always added the disclaimer” that it was “not medical grade” equipment. Now “we’re moving towards” that grade, he says. This technology is upgrading itself extremely quickly – you can see a parallel in the rise of Oculus Rift in the Virtual Reality arena. Now, in the same way, Fletcher feels a “killer piece of kit” is needed. Fletcher thinks the movement from a “little bit clunky” to a “slick design” is inside a two or three year period. And once it arrives it will be marketed by a big name like Apple or Samsung and gain huge market traction. The Fitbit style solution is the most obvious first consumer step with quantified wellbeing being presented as simple graphics. Devices will be able to take a direct brain reading and maybe blend this with historic data and/or, other physical body data, in order to make judgements about your overall health. He also feels with the “right brand name on it” the “current gimmicky mind training idea” will be picked up as an “organisational tool” and perhaps used for team building. In a similar vein, this is clearly something HR managers would want to get hold of as it could be used to provide tangible evidence of ‘talent’. Other people, however, might not be so impressed by this application. Longer-term on the “cusp of three years” Fletcher thinks this technology will be built into the next generation of products like Google Glass and Microsoft Hollow Lens. “Input” was “missing” from Google Glass he explains. There was nothing that really differentiated it from your phone. But if you added your own brain data it would become entirely unique. It could easily become the “2020 version of the 1960s mood ring” he says not entirely flippantly. People “put a lot of faith” in brain waves and it could also add a more quantifiable element to the future dating experience. Then, of course, there is entertainment. At present how you feel at different moments in a film all boils down to the skill of the scriptwriter and director. Their job is to lead an entire audience through a one-size story. But there is no reason why in future this could not be targeted at you alone, with different scenes delivered to you based on your mental response. In some ways all this seems quite scary and sci-fi. In others ways it just seems inevitable. In effect, we’re already there with a host of ever-more predictive apps and a raft of personalised data experiences. Interestingly, Fletcher says when he talks about all this to first year university students, who have grown up with sophisticated technology, he gets very little reaction. 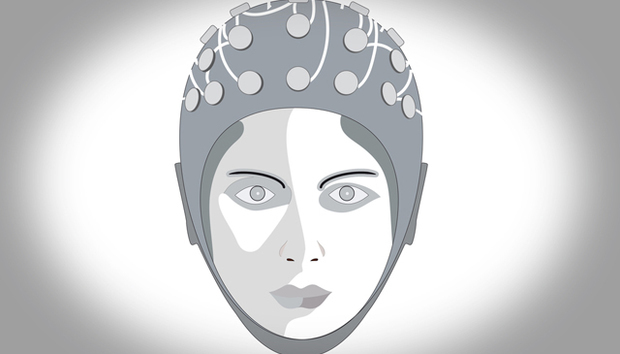 Whichever way you look at it, ubiquitous brainwear does seem the next step. Yet as Fletcher concludes: “People either make technology work for them, in a way they want it to work, or they have ways of avoiding it”. So, by 2018 it will be your choice to embrace brainwear… or simply pretend it is not happening.